Tai Chi is an exercise that benefits people for all ages, especially the seniors, who enjoy the soft, flowing movements. Tai Chi Chuan first showed its unique advantages over other Chinese martial arts in the 1953 National Sports Mass Meeting. It has no specific requirements for space and apparatus. It can be practiced by either men or women and older or younger practitioners alike. Before the birth of the modern Tai Chi Chuan, its complexity and its many different styles prevented it from spreading to the general public. The forms of traditional Tai Chi Chuan may involve 85 to 100 different movements, which could take more than 20 minutes to complete. Like Chinese dialects in different regions, the forms of Tai Chi Chuan also varied significantly. The most popular and wide-spread styles are: Chen-style Tai Chi Chuan, Yang-style Tai Chi Chuan, Wu-style Tai Chi Chuan, Wu Yuxiang-style Tai Chi Chuan and Sun-style Tai Chi Chuan. To make it easier to be followed by beginners, old Tai Chi master Li Tianyi, uncle of Li Deyin, along with other masters, developed a simplified and shortened version of the Tai Chi Chuan in 1956 by dropping repetitious and difficult movements. It originated from the basic movements of the Yang-style Tai Chi Chuan. This style had easier movements and actions, which combined hardness, softness and a natural flow. Practitioners could relax to form softness, which then transforms into hardness. The new short form consisted of 24 movements, and this routine could be performed in four to eight minutes. It was less physically demanding than longer forms and especially appealed to older beginners who want to improve their health. 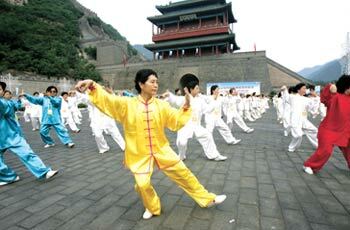 Practicing short forms could also lay a sound foundation for learning longer forms or other styles of Tai Chi Chuan. Tai Chi Chuan is one of the most precious parts in Chinese therapeutic exercise, for it combines martial arts and qigong (deep breathing exercise). Deep and regular breathing accompanies the whole process of a Tai Chi Chuan routine. A participant breathes in through the nose and out through the mouth. He or she breathes in when pulling back or reaching up, and breathes out when going forward or reaching down. The gentle flow between various movements contributes to a state of calmness. The nervous system can be regulated and strengthened in the process. If practised properly, every movement of Tai Chi Chuan will be a training of body, energy and mind, known as jing, qi and shen, the "three treasures" of every person.